Place stop-loss, take-profit, trail, break-even, etc. The RobotFX Heiken Ashi expert advisor is an all-in-one trading solution for traders trading with the trend, so we can safely say that the Heiken Ashi expert advisor is a trend trader. It can detect the trend - if the trader chooses so - and trade accordingly, meaning that the EA will only buy if the trend is up and/or only sell if the trend is down. The trend itself is decided by the Heiken Ashi color on the higher or current timeframes. 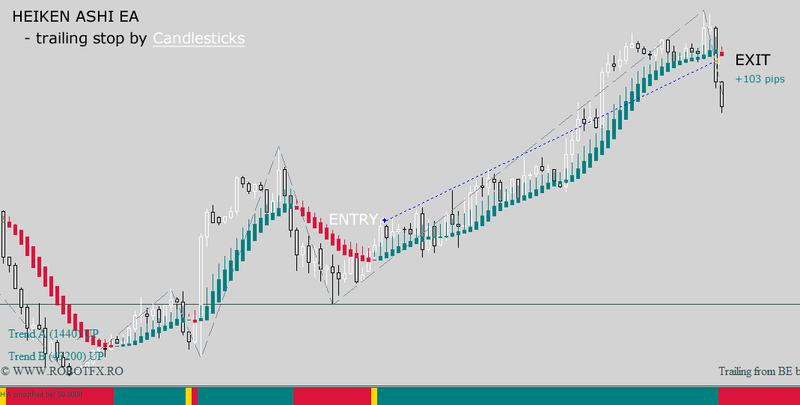 It should be noted however that the trend detector can also be disabled and that the Heiken Ashi EA can be allowed to trade by simply following the Heiken Ashi signals on the current timeframe. To better understand better how this trend trader with hedging abilities works, please take a look at the picture below. 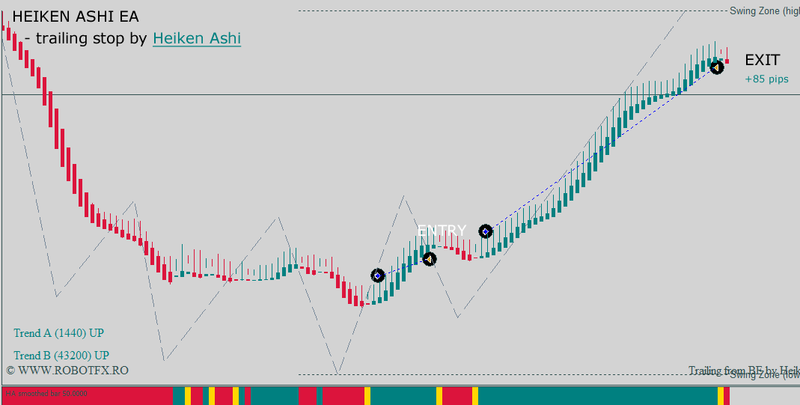 In the trading chart above, the Heiken Ashi is in uptrend on H1 and H4, meaning that the Heiken Ashi color is green (up) on both of these timeframes. The type of Heiken Ashi candles can be customized by the trader, who has the possibility to set the moving averages' method (smoothed, exponential, simple, linear), period or shift, for the trend detection as well as trade entry signals. When one or both trend detectors are used, the uptrend or downtrend is determined by the Heiken Ashi color on their respective timeframes. 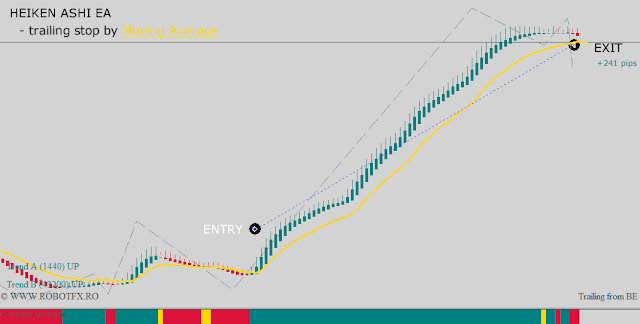 When any of the Trend A or Trend B are enabled, they are displayed in the lower-left corner of the chart. Note that if the trader enabled both these trend detectors (A and B), the EA will consider entering a trade only if they both coincide and it will ignore trading signals if one trend is up while the other is down. 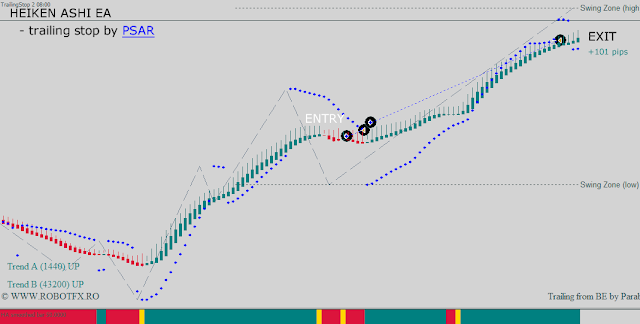 When the Heiken Ashi candles change their color from down (red) to up (green) the EA will open a long trade; opposite happens for short trades. This entry signals can be validated by another safety feature - if the trader wants to use it - that is the swing zone confirmation. 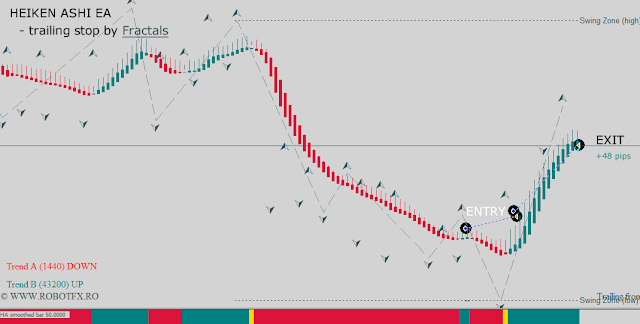 This swing zone is also used by both the Fluid and the NonLagMA expert advisors, and it has the purpose to ensure that the EA will not open buy trade when higher-highs are formed, or sell trades when the price forms a lower-low. After a trade is opened, the Heiken Ashi EA has the ability to place a classic stop-loss and/or tkae-profit, and also trail the price using various methods (using the Tailing Stop EA algorithm) including trailing by Heiken Ashi candles, moving average, PSAR, ATR and others. 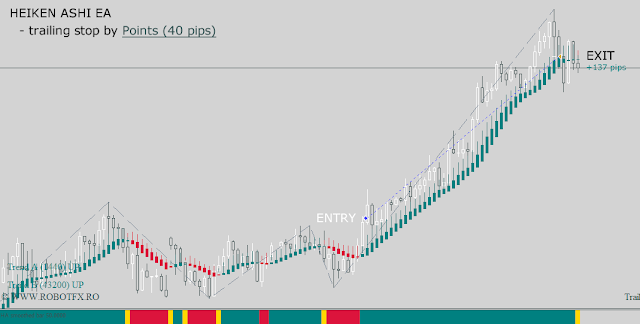 This Heiken Ashi EA can even martingale if the previous trade closed in negative profit. 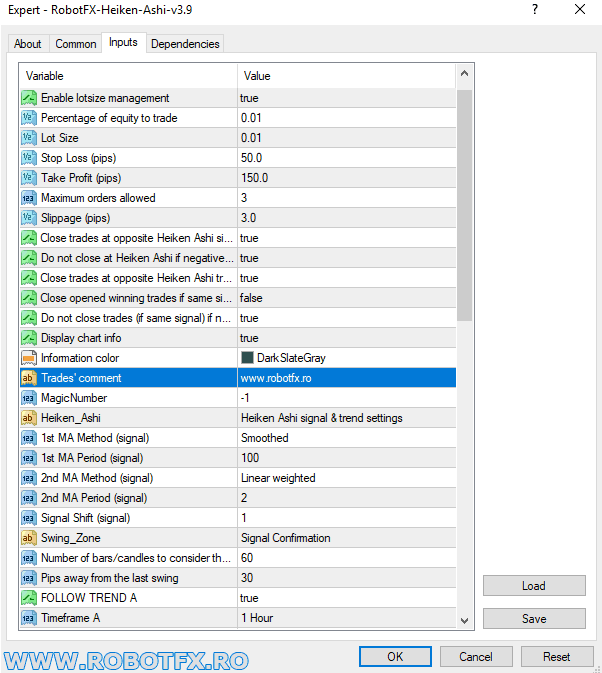 Below are some examples of trades opened and closed with different trailing stop options. Money management is also possible by setting the EA to use a percentage of the equity as lotsize, or by using a fixed lotsize. Take your time to understand what each of these settings does. After you’ve done that, try to optimize the default settings based on the pairs you are trading, the time-frame you trade on, your equity and initial LotSize etc. Pips away from the last swing - set to 0 pips to deactivate the swing zone. Example: when using a “Pips away from last swing” of 30 pips the EA will enter a trade when the Heiken Ashi signal changes color AND the price (at that moment) is at least 30 pips away from the swing zone upper level (when buying) or lower level (when selling). This should be used to reject buy signals that might occur on overbought areas or sell signals that happen in oversold areas. FOLLOW TREND A / FOLLOW TREND B - if set to true, the trader can also choose the Heiken Ashi settings used to detect the trend. Both, one or none of these option can be used. I have been watching the Heiken Ashi videos and I am interested in downloading a copy to try on my mt4 demo account. I tried to download but I was not successful in seeing it when I downloaded and copied to my expert advisor file in mt4. 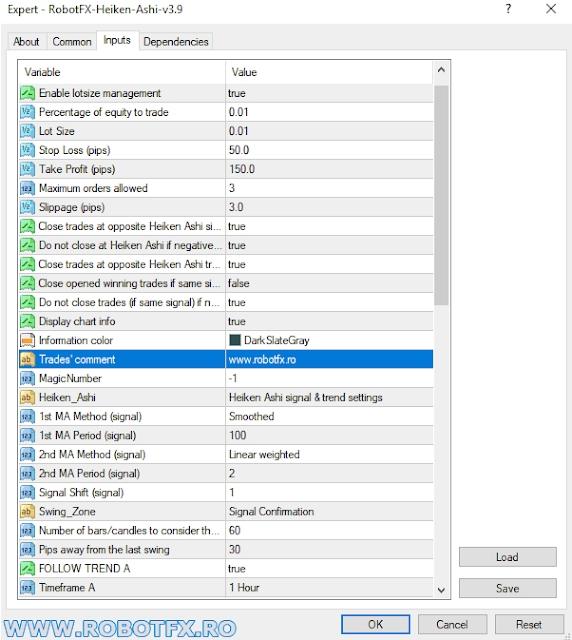 I am fairly new with mt4 so if you can explain how I get the demo on my mt4 I would be grateful.